central heating is where you have a 'Feed & expansion cistern or header tank' in the loft which fills the boiler and radiator system initially and keeps it topped up with water on a long-term basis to replace losses from evaporation and/or minor leaks. A float valve in the cistern (more correctly called a 'feed and expansion cistern', F&E tank) and connected to mains water keeps the water level in the tank and the heating system correct. The primary advantage of an open-vented system is that no user intervention is required to keep the system topped up with water. 1) Float valve seizes up and sticks closed. Then as the months and years pass by, the water level in the F&E tank drops to nothing, and then the water level in the heating system proper falls. Eventually there isn't enough water for the pump to pump and the system stops working. Sometimes boiler banging noises also happen, and tripping of the boiler over-temperature thermostat. Easily fixed by freeing off the float valve and re-filling the system. 2) Cold feed pipe blocks. This is more common that you might first think. The tee piece where the cold fill pipe joins the system proper accumulates corrosion deposits and they form a rock-like blockage which results in similar symptoms to 1), except the F&E tank remains full of water! The fix is to cut out the tee and solder in a new one. (sometimes known as 'pressurised') central heating is where the F&E tank is dispensed with and replaced with FAR more complicated and prone-to-failure apparatus. Because the F&E tank is no longer available to accommodate expansion in the water contained in the system when it heats up, an expansion vessel is fitted instead. This is a sealed container fitted with a compressible air bladder connected to the heating circuit, and is often fitted inside the boiler. The second device needed is a method of initially filling the system, and topping it up if/when the system pressure degrades to zero. This is called a 'filling loop', and is usually a silver-braided length of flexible pipe about 12" long which bridges from a mains cold water pipe to a heating circuit pipe, and has valves on both ends. The installer or user turns on the valves to manually fill the system, and turns it off again when filled and the pressure set correctly, and strictly speaking should disconnect the loop (but nobody ever does). There will be a pressure gauge on the system somewhere so the user can see to turn off the filling loop when the system is filled to the right degree, but it will not necessarily be next to the filling loop! The third device required is a pressure relief valve (PRV). This opens should the system pressure ever rise dangerously high to prevent busting of pipes, radiators etc. It discharges excess pressure through a pipe to outside. To prevent boiler damage from air entrainment, some boiler models (combi's especially) have an internal pressure switch that turns the boiler OFF should the system pressure fall near zero. Naturally many users interpret this as a boiler breakdown and call a boiler engineer around only to find they could have saved the call-out charge had they realised they could top it up themselves. 2) System pressure loss. This time the pressure loss is for a different reason. The expansion vessel has stopped working. The boiler fires and heats up the system water. The expansion vessel is not able to accommodate the increase in volume of the system contents and the pressure rises significantly. When the pressure gets to 3.0 Bar the automatic pressure relief valve opens and allows however much water is necessary to escape to prevent pressure rising above 3.0 Bar. When the system cools later, the pressure therefore drops below 1.0 Bar because there is less water in the system. The boiler pressure switch (if there IS one) turns the boiler off until someone re-pressurises the system. Expansion vessels generally stop working for any of three reasons. The air charge may have leaked away through the car-tyre type valve used for pumping them up in the first place, the neoprene bladder may have perished and leaked it's air into the circulating water, or the flexible hose connecting it to the system may be blocked with corrosion deposits. 3) Excess system pressure. This shows up as water dribbling constantly from the pressure relief valve discharge pipe and a reading on the pressure gauge of 3.0 Bar. It's nearly always caused by the user not disconnecting the filling loop after use, which disguises failure of the filling loop valve to turn off properly. The system continues to work perfectly well but the constant refreshment of the circulating water with new, oxygen-saturated water leads to rapid and expensive-to-repair internal system corrosion and early failure of the pressure relief valve. A less common cause of the same problem in combi boilers is an internal leak inside the plate heat exchanger that heats the tap water. Mains pressure forces mains water through the leak into the heating system water and out through the PRV. A new plate heat exchanger is necessary. are by far the most popular boiler type, accounting for over half of all new boiler sales within the UK. 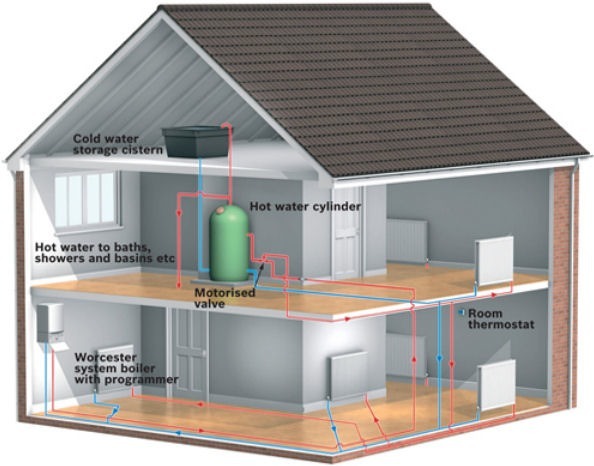 Most wet central heating systems use a boiler to heat a copper cylinder in the airing cupboard to provide hot water. A combination boiler (usually referred to as a 'combi') heats water for the taps from within the unit and combines this with central heating. Combi boilers don't need a water cylinder on a cold water tank to feed it. Hot water running costs are therefore slightly lower. The water is heated as you use it and doesn't sit in a cylinder which is gradually going cold. However, the rate at which hot water comes out of the taps is not likely to be as good as with a traditional storage cylinder, particularly in Winter. In homes where a number of taps and showers are likely to be used at the same time, you should seek manufacturers' advice on whether or not the combi is suitable. Showers fitted to this boiler must be a 'mains pressure' type. Because combi boilers are fed directly with mains cold water, there must be enough water pressure for them to work properly. Manufacturers will state what the minimum pressure should be for each model. If you have low pressure there are options to improve the flow rate and water pressure, please call our office to discuss these solutions.